Archimedes, however, in writing to King Hiero, whose friend and near relation he was, had stated that given the force, any given weight might be moved, and even boasted, we are told, relying on the strength of demonstration, that if there were another earth, by going into it he could remove this. ΚΑΙ ΜΕΝΤΟΙ ΚΑΙ ΑΡΧΙΜΗΔΗΣ, ΙΕΡΩΝΙ ΤΩ ΒΑΣΙΛΕΙ ΣΥΓΓΕΝΗΣ ΩΝ ΚΑΙ ΦΙΛΟΣ, ΕΓΡΑΨΕΝ ΩΣ ΤΗ ΔΟΘΕΙ ΣΗ ΔΥΝΑΜΕΙ ΤΟ ΔΟΘΕΝ ΒΑΡΟΣ ΚΙΝΗΣΑΙ ΔΥΝΑΤΟΝ ΕΣΤΙ, ΚΑΙ ΝΕΑΝΙΕΥΣΑΜΕΝΟΣ, ΩΣ ΦΑΣΙ, ΡΩΜΗ ΤΗΣ ΑΠΟΔΕΙΞΕΩΣ ΕΙΠΕΝ ΩΣ, ΕΙ ΓΗΝ ΕΙΧΕΝ ΕΤΕΡΑΝ, ΕΚΙΝΗΣΕΝ ΑΝ ΤΑΥΤΗΝ ΜΕΤΑΒΑΣ ΕΙΣ ΕΚΕΙΝΗΝ. Archimedes, that he might transport the entire globe from the place it occupied to another, demanded only a point that was firm and immovable; so, also, I shall be entitled to entertain the highest expectations, if I am fortunate enough to discover only one thing that is certain and indubitable. Nihil nisi punctum petebat Archimedes, quod esset firmum & immobile, ut integram terram loco dimoveret; magna quoque speranda sunt, si vel minimum quid invenero quod certum sit & inconcussum. What Archimedes said of the mechanical powers, may be applied to Reason and Liberty: “Had we,” said he, “a place to stand upon, we might raise the world.” The revolution of America presented in politics what was only theory in mechanics. Peter the Hermit, Calvin, and Robespierre, sons of the same soil, at intervals of three centuries were, in a political sense, the levers of Archimedes. Each in turn was an embodied idea finding its fulcrum in the interests of man. Pierre L' Hermite, Calvin et Robespierre, chacun à trois cents ans de distance, ces trois Picards ont été, politiquement parlant, des leviers d' Archimède. C' était chacun à chaque époque une pensée qui rencontrait un point d' appui dans les intérêts et chez les hommes. Il y songeait, lui, et sérieusement même, se creusant la cervelle pour trouver une direction à cette force unique quatre fois multipliée avec laquelle il ne doutait pas que, comme avec le levier que cherchait Archimède, on ne parvînt à soulever le monde,lorsque l'on frappa doucement à la porte. O vanity! you are the lever with which Archimedes wanted to lift the earthly globe! О самолюбие! ты рычаг которым Архимед хотел приподнять земной шар! “Give me whereon to stand”, said Archimedes, “and I will move the earth.” The boast was a pretty safe one, for he knew quite well that the standing place was wanting, and always would be wanting. But suppose he had moved the earth, what then? What benefit would it have been to anybody? The job would never have paid working expenses, let alone dividends, and so what was the use of talking about it? From what astronomers tell us, I should reckon that the earth moved quite fast enough already, and if there happened to be a few cranks who were dissatisfied with its rate of progress, as far as I am concerned, they might push it along for themselves; I would not move a finger or subscribe a penny piece to assist in anything of the kind. The little bird, the little fish, the little animal learn not by principle, but empirically. And when he learn to do, then there is to him the ground to start from to do more. ‘Dos pou sto,’ said Archimedes. ‘Give me a fulcrum, and I shall move the world!’ To do once, is the fulcrum whereby child brain become man brain. Don't talk to me of your Archimedes' lever. He was an absentminded person with a mathematical imagination. Mathematics commands all my respect, but I have no use for engines. Give me the right word and the right accent and I will move the world. Archimedes promised to move the Earth if they would give him a point of support. That was not badly said. However, if they offered him the needed point of support, it would have turned out that he had neither the lever nor the power to bring it into action. The victorious revolution gave us a new point of support, but in order to move the Earth it is still necessary to build the levers. Revolution Betrayed: What is the Soviet Union and where is it going? Archimedes once said, “Give me a place to stand and I will move the world.” Today he would have pointed to our electric media and said, “I will stand on your eyes, your ears, your nerves, and your brain, and the world will move in any tempo or pattern I choose.” We have leased these “places to stand” to private corporations. These proposals offer no quick and easy solution to the problems of peace. But they are essential tools. “Give me a fulcrum,” Archimedes is reported to have said, “and a place to standand I will move the world.” The tools I have suggested can be our fulcrumit is here we take our standlet us move the world down the road to peace. I’m told that John F. Kennedy was fond of quoting Archimedes, who explained the principle of the lever by declaring: “Give me a place to stand, and I can move the world.” My fellow Americans—here I stand. Come join me, and together we will move the world to a new era of a just and lasting peace. A young monk began the Protestant Reformation, a young general extended an empire from Macedonia to the borders of the earth, and a young woman reclaimed the territory of France. It was a young Italian explorer who discovered the New World, and the thirty-two-year-old Thomas Jefferson who proclaimed that all men are created equal. “Give me a place to stand,” said Archimedes, “and I will move the world.” These men moved the world, and so can we all. Archimedes said, ‘If you give me a lever and a place to stand, I can move the world.’ Your excellent education here has given you that lever, and I hope that you will use it to move our country to address the many challenges we face more effectively. To paraphrase Archimedes, give me a place to stand and a lever strong enough and I can move the world. Well, The Heritage Foundation has been that place and their lever has been the truth And so far, you have been real world movers. 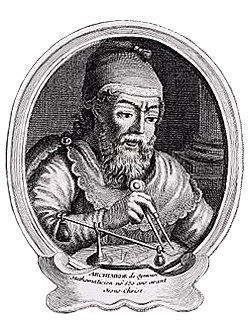 The great scientist, Archimedes, made his famous statement, “Give me a place on which to stand, and I will move the earth.” He was challenged to put his words into action, and according to the historians, he arranged a series of pulleys and cogs that allowed him to pull a ship out of the Syracusan Fleet from the water onto the beach. Today in addressing the relationship between science and technology to national security we must operate as a cooperative team trying to “move the earth” in a sense toward freedom, justice, opportunity, and sustainable development. Or America can emulate Archimedes and, from the position of strength where we stand, find a lever to move the world. Archimedes once said that “give me a lever, a place to stand, and I will move the world.” History has given Secretary [of State Madeleine] Albright a place to stand, and using her heartfelt conviction, her steady determination, and her visionary leadership as her lever, and with your extraordinary help, she is moving the world. Centuries ago, Archimedes discovered the secret behind the lever and declared: “Give me a place to stand, and I will move the world.” Today, history has given the United States a place to stand. Using our ideals, our diplomacy and our military might as our lever, we have the unique opportunity to move the world, not simply for the betterment of others, but for the betterment of ourselves. Centuries ago, Archimedes discovered the secret behind the lever, and declared “Give me a place to stand, and I will move the world.” Well, today, we have earned the power of Archimedes. The place where we stand is the sole global power of the world, a beacon of hope to free people around the world. And from this position of strength and influence, we can move the world in a better direction. How will we move it? What is our lever? But he discovered the principle that Archimedes discovered, as he said, give me a place to stand and I will move the world. Well, in the first years in the Senate, he found a device that I used to use and he has followed my example. He is given five minutes to ask questions. And he usually takes exactly five minutes to ask every question and then imposes upon the witness 10 minutes to have an answer. It has served him extraordinarily well.